On top is an image provided by the European Space Agency's (ESA) environmental satellite, Envisat. 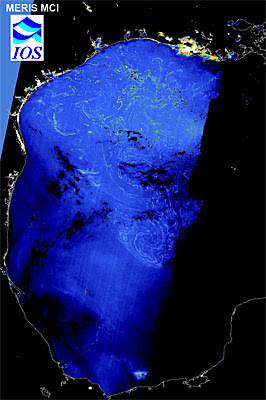 It shows Sargassum seaweed in the Gulf of Mexico. This is the first time that a satellite has captured images of such life. Scientists hope to use the data to analyze and predict climate change. 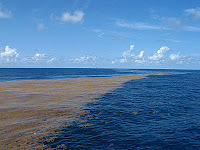 Jim Gower of the Canadian Institute of Ocean Sciences says that Sargassum is often associated only with a part of the North Atlantic called the Sargasso Sea. Explorers of old during the Age of Discovery have described this area as full of seaweed that can bog ships.